If you have ever wondered how to wash clothes without detergent, there is a new product from RainSoft that gets clothes incredibly clean without detergent or any other type of off-the-shelf laundry product. It’s called CleanStart®, and it utilizes the same technology that RainSoft has provided to Hilton and Marriott for their large-scale laundering operations. CleanStart® is a highly innovative laundry solution that greatly reduces – and often eliminates – the need for detergent, softeners, and bleach. By infusing cold wash water with Activated Oxygen, the CleanStart® detergentless laundry system transforms it into a powerful disinfecting solution, one that’s capable of producing the cleanest and freshest-smelling laundry that you’ve ever experienced! Smaller energy bills – Because only cold water is required, you won’t have to consume large amounts of energy simply for the sake of doing laundry. CleanStart®, itself, consumes less energy than a 40-watt light bulb. Less environmental pollution – Unlike chemically synthetic detergents, Activated Oxygen is perfectly harmless to the environment. No chemical irritation – CleanStart® is a great product for infants, young children, and others with sensitive skin as it does not wash clothing with irritating cleaning detergents and disinfection products. Longer lasting clothing – Clothing fabric life will be extended by not using products that cause it to gradually break down. 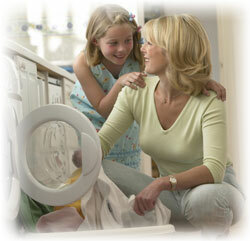 Money savings – Investing in the CleanStart® system makes sound financial sense. Over a 10-year period, a family of four can save approximately $6,500 by doing their laundry with the aid of this revolutionary product. The answer to the question “How to Wash Clothes without Detergent?” has never been clearer. Contact your local authorized RainSoft dealer today if you’d like to learn more about CleanStart®, a money-saving and eco-friendly detergent-less laundry solution for the home.